In 2003 Steve and Paula Black purchased the 54-acre Perry Bower Vineyard from Mary Lynne Perry and Chris Bower. Perry and Bower planted the vineyard in 1993 and operated the Dundee Springs Winery. The Blacks also developed the Doe Ridge Estate vineyard in Yamhill-Carlton AVA. The Four Graces was named after the Black’s four daughters-Vanessa, Jillian, Alexis, and Christiana. Son Nicholas appeared on the winery’s reserve Pinot Noir as the “Keeper of the Four Graces”. With four sisters, son Nicholas probably had his hands full with that job!! The winery won numerous awards for their wines over the years. The winery was located at 9605 NE Fox Farm Road Dundee, OR 97115. 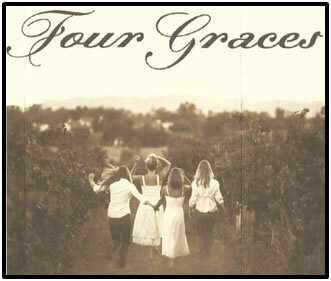 In 2014 the Four Graces was purchased by California based Foley Family Wines.